So I’m back here in my hotel, and I basically want to get it all down so I don’t forget anything. Today, I took an overbooked 9:30 a.m. Delta flight to Mexico City from SLC. It was apparently so desperately overbooked that they kept escalating the amount of money they offered in the travel voucher until it hit $1000. That’s when I volunteered to go off the plane and get the free $1000 of Deltabux, but unfortunately, someone much closer to the front of the plane beat me to it. Bad news: no $1K. Good news: I got to Mexico on time for what’s next. Mexico City is a very large city, though. My hotel is near the Arena de Ciudad de Mexico, where the Jazz will play the Magic on Saturday. It’s on the north end of the city. Azteca is on the south end of the city. If there’s no traffic, it’s 31 minutes. But because there is traffic, it’s at least an hour and a half drive, and more like two hours if there’s a game. This was enough to dissuade my friends in Jazz broadcasting and social media who were on this trip from coming with me, so I went alone. I screwed up because of the time change, and only got on an Uber at about 7:00, the game was at 8:30. So if I wanted to make it before the match began, I’d have to find a faster way. So I told my driver to drop me off at the nearest Mexico City Metro stop. The Mexico City Metro is actually kind of awesome. The signage is good, it’s faster than driving, there are a ton of stops, etc. Tickets are five pesos, or in US terms, it’s a quarter. The downsides are that they don’t have ticket machines, only one lone window where a nice woman takes your loose change for tiny paper tickets that look like you’ve entered a raffle and you’re waiting to see if you’ve won. The line for this window was about 100 feet long, but this woman was efficient AF, and the line actually moved pretty quickly. The Metro is also crazy crowded. I don’t know if you’ve seen those videos from Japan, where they kind of crowd people into the train and then the people in line outside the train push to try to squeeze more people on, but it was like that. The cool thing was the bigger people used their bodies to protect the frail — kids, elderly — on the train from getting squished, an important public service. So I went on Metro, then connected on light rail (more waiting for another ticket), then found myself at Azteca about 8:35. 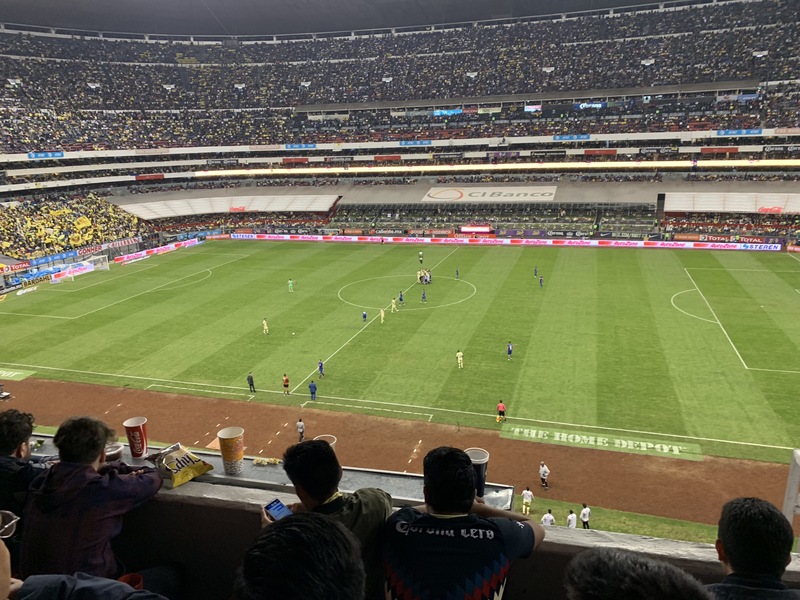 Despite seating 87,000 people (significantly reduced from the >100K after the 1985 renovation), Azteca feels smaller once you’re inside than the similarly-sized football stadiums I’ve been to. Honestly, the biggest reason is that they pack you in, the seating is basically airplane-level width and leg room. 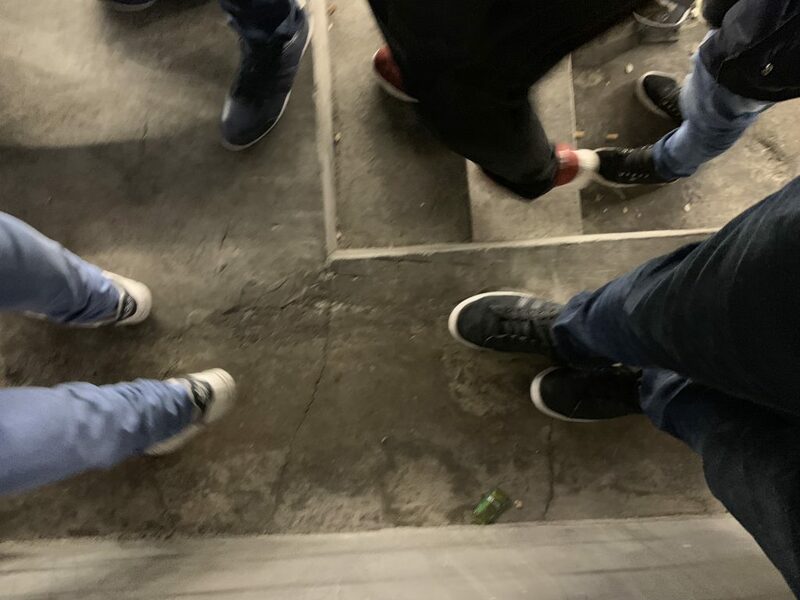 Finding your way to your seat involves a lot of bumping into people, repeating “con permiso,” and even occasionally putting your hand on someone’s shoulder or seat to keep balance. Azteca doesn’t have concession stands, or if it does, it’s like two of them. Instead, it has vendors that are doing the tip-toe dance through not only the aisles but the seats themselves, selling cervezas (100 mx, or $5), pizza (60 mx, or $3), candy and sweets (anywhere from 20-100 mx, $1-5). Everyone works together to make the vendor system work: beers and money are passed efficiently and honestly from fan to fan, and the vendors are quick and helpful. At some point, I realized that many people around me were on their own informal tabs, with the cerveza seller counting cups at the end of the night to figure out how much everyone had. Honestly, it was really, really nice not to have to go get concessions myself, and the disruptions in view weren’t a big deal whatsoever. Both sets of fans were awesome. 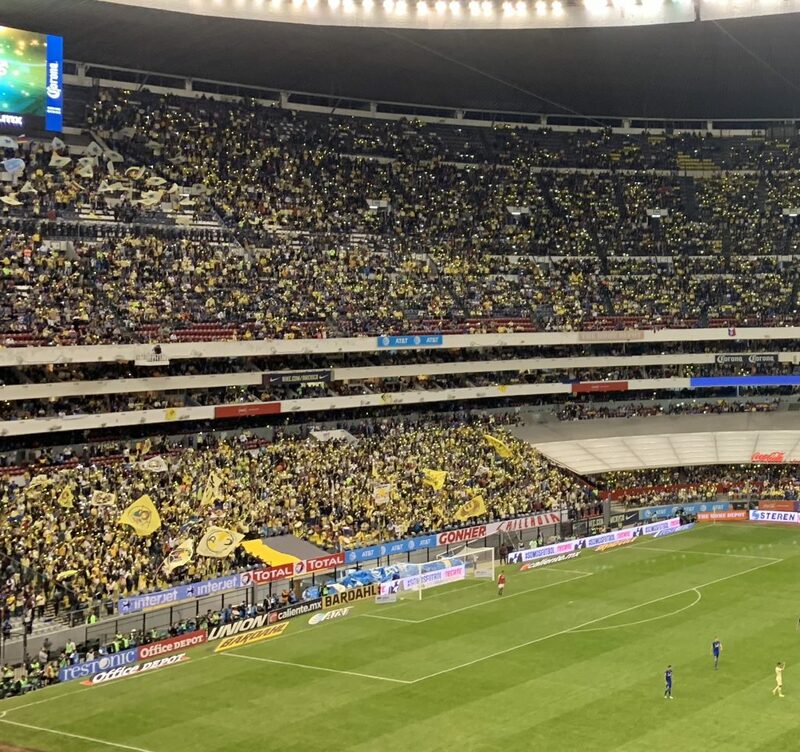 I’d say it was probably 65/35 Club America fans. If you’ve been to a RSL game at Rio Tinto, think La Barra Real, but instead of like 40 well-intentioned fans, it’s 40,000. Loud chants throughout, back and forth chants between the two groups, but in a mostly playful way. Okay, a lot of swearing in said chants and heckles, but both sets of fans were super civil outside the stadium. Both sides did the cell-phone light thing at different times of the match, but most of the fans had taped over their cell-phone light with the color of their team (yellow for America, blue for Azul). This was neat. To my left sat next to a man and his teen-aged son. The man (never got his name… I’m bad at that) used to rock climb when he was younger, and so had been to Salt Lake City for that. He also was a Cowboys fan, and told me that in his estimation, over 50 percent of NFL-loving fans in Mexico City preferred the Cowboys. His son, he said, played for the UNAM “Pumas” academy, but he said it killed him to play for Pumas when he was actually an America fan. To my right sat a chain-smoking group of 20-somethings. They were fun, chanty, loud, and very good at the cerveza vendor system, but it was incredible the level to which they were stress-smoking these cigarettes in the stands… they’d light another one even before the last cigarette they’d had completely burned out. They had NFL fantasy football apps on their phones too. I sat right below the TV press boxes. I was surprised at how many large studios they had room to accommodate: it seemed like they had five or six channels with big, big studios above us (If you’ve seen it, think about the size of the studio they do Jazz pre/half/postgame TV in. Then multiply by six!) Meanwhile, the fans filtered in and out on these tiny pathways. The match itself was pretty garbage, the kind of contest that soccer-haters bring up constantly. The nice way to say it is that both teams were feeling each other out, saving their best for the second leg. The accurate way to say it is that both teams played very poorly and were primarily interested in giving the ball away. There was only one decent chance all game, a Cruz Azul shot that went off the crossbar in stoppage time. When that didn’t go in, America fans cheered like they themselves had scored a goal. On the way home, I checked out the stores that lined up on the sidewalk back to the train station, with their assortments of very knockoff soccer gear that I love. Then, I piled into a train with a supporter group on it.